The online scientific journal "Transport Law and Security" (ISSN 2500-1868) publishes research materials, summaries, reviews on the topic of legal maintenance of the transport industry and legal aspects of transport security. The journal is intended to arrange a dialogue of researchers, teachers, post-graduates and master students, as well as specialists interested in the current issues of legal maintenance of all components of the transport industry. The journal is issued 4 times a year (in March, June, September, and December). The scientific field of the journal is an area of Law - 12.00.00 (according to the classification of the Higher Attestation Commission of the Russian Federation). 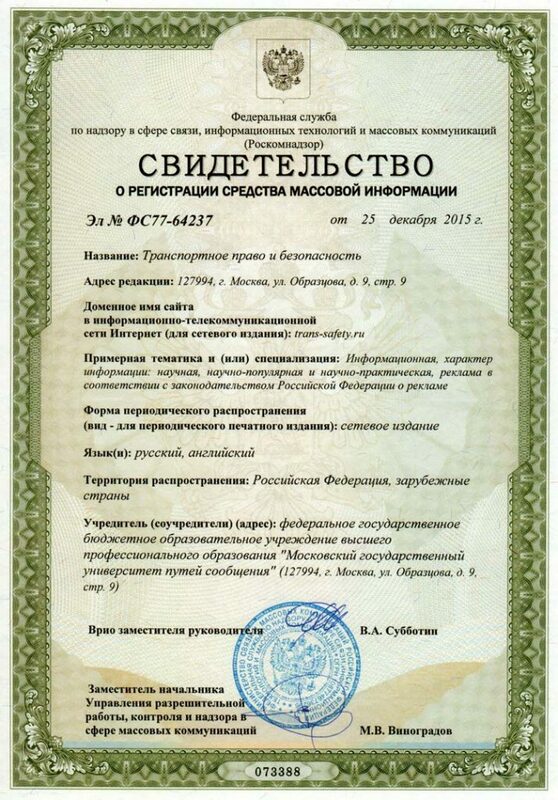 The number of the Registration Certificate of Mass Media is EL № FS 77-64237, dated December 25, 2015.